Pancake day, traditionally a day of feasting before the 40 days of Lent, has now also been adopted as a fun event – everyone can remember the childhood thrill of watching pancakes being tossed. If you are making pancakes for the first time, there is the basic recipe below along with ten top tips from Proper Pancake’s expert Nicky. She has also created a special topping for us, making the most of Cornish apples from Polpier’s orchard. Sift the flour into a large bowl or jug. Break the eggs into a small bowl to guarantee no egg shell pieces get into the mix, then add to the flour. Pour in the milk and add a pinch of salt, then whisk to a smooth batter. The batter can be affected by temperature of your kitchen, so if it seems rather thick add a little extra milk. Leave the batter on a counter top for 30 mins to rest. Wipe a medium frying pan or crêpe pan with oiled kitchen paper and place over a medium heat. When hot, cook your pancakes for 1 min on each side until golden – have a go at tossing them with a sharp flick of your wrist. If you don’t fancy pancakes on the ceiling, carefully flip over with a spatula. Keep the pancakes warm in a low oven until you have made the required number. Once cold, you can layer the pancakes between baking parchment, then wrap in cling film and freeze for up to 2 months. When defrosted, gently reheat in a warm oven. Always buy the best quality ingredients – Cornish free range eggs, Cornish milk and organic flour are essential to creating my fluffy pancakes. Never over stir your batter as this will result in chewy pancakes. Use a good, flat non-stick pan. Coconut oil is fantastic for cooking pancakes if you need oil, I always use Lucy Bee. Alternatively, cook your pancakes with butter to add a richness to their flavour. Cook the pancakes using a medium heat, never go hotter! Have fun and experiment with flavours. If you have guests, always make more than you think you will need to ensure you don’t miss out! Pancakes don’t always have to be sweet, there are some great savoury recipes out there. A favourite of mine is Otto lenghi’s green pancakes with lime butter, it’s delicious! 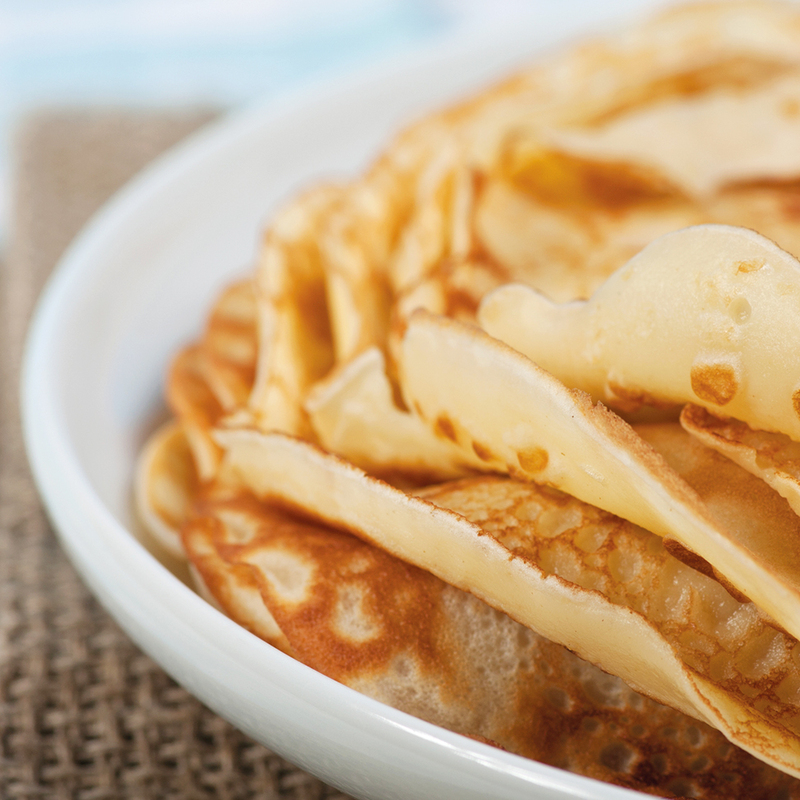 Remember, pancakes are not just for pancake day – they’re great all year round and at any time of the day! 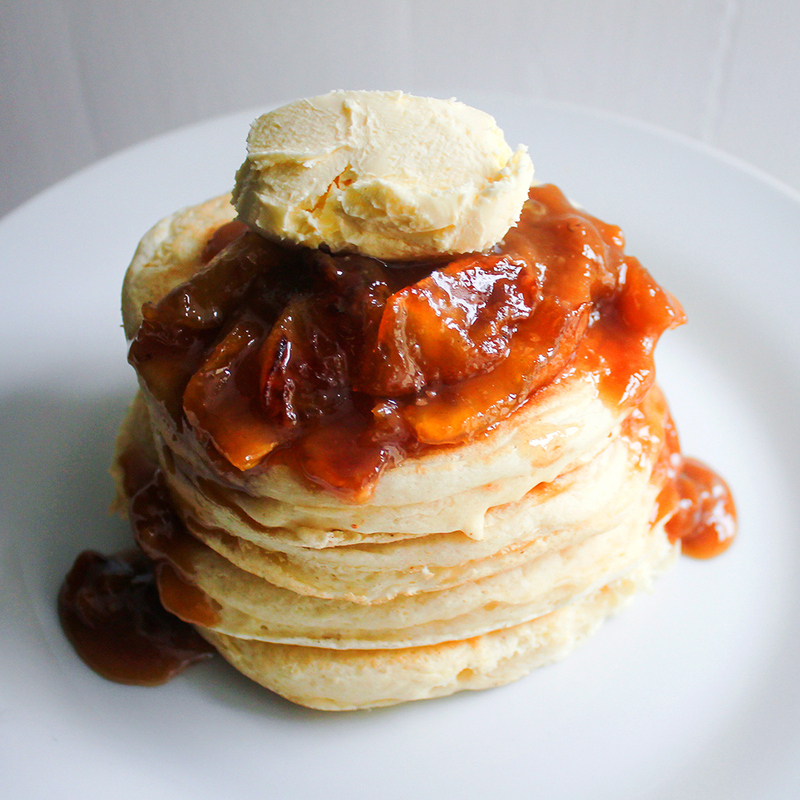 This recipe has been tried and tested in the Proper Pancakes kitchen using the best apples in season and delicious Cornish butter. 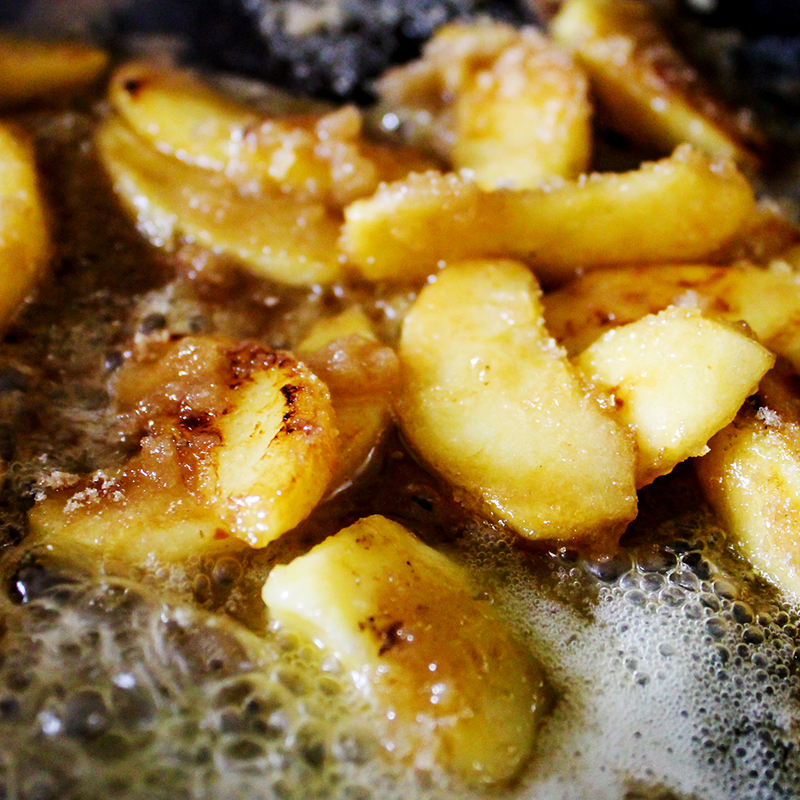 Heat a little coconut oil in a non-stick pan over a medium heat, then peel, core and chop two apples of your choice. Cut into thin slices, no bigger than half a centimetre thick. Add the apples to the pan and cook for approximately 5-8 minutes until softened and a golden colour has started to develop. Cooking time will depend on the thickness of slices and type of apple you choose. Add the butter and sugar, reduce the heat to medium/low and simmer gently for a further 3-4 minutes until the sugar and butter have combined, thickened and caramelised a little. Be careful not to overcook as you will end up with a slightly granular, chewy toffee like substance or burnt butter! Serve with pancakes and top with a good spoonful of Roddas clotted cream – if you’re feeling extra naughty, why not combine a little brandy with the cream? Remember that you are dealing with a topping that contains hot sugar, so please be very careful when serving and allow to cool a little before eating. Nicky is happy to bring her Proper Pancakes van to parties and events. Visit www.properpancakes.com for more information.